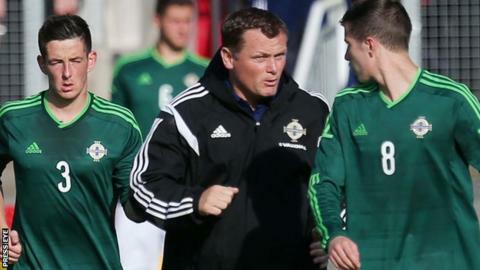 Jim Magilton will stay on as Northern Ireland U21 manager with Damien Johnson, Kevin Horlock and Mark Crossley in his backroom team. Magilton replaced Stephen Robinson as manager at the end of the Euro 2015 qualifying campaign. Fellow former Northern Ireland internationals Johnson and Horlock will be assistant coaches. Former Nottingham Forest player Crossley will continue in his role as goalkeeping coach for the U21s. "I am delighted to have Jim Magilton in charge of the very important Under 21 squad," said Northern Ireland senior manager Michael O'Neill. "I feel that given Damien, Kevin and Mark's experience, they will be perfect role models for these young players to assist them in their football careers." Magilton, who is currently the Irish FA's Elite Performance Director, is relishing taking charge of the team. "I was manager of the Under 21s at the end of the last campaign and am excited by the prospect of working with this group over the next two years," said the former Ipswich Town midfielder. "I hope that with this backroom team on board together we can play a role in helping some of these players make the step up to the senior international side." Horlock joined the U21 set-up in 2013 while Johnson is a coach at Blackburn Rovers Academy. The Northern Ireland U21s will start their 2017 European Championship qualifying campaign with a home game against Scotland on 5 September and an away encounter against Iceland three days later.